ConceptDraw defines some flowchart types, divided into ten categories. Every flowchart type has specific shapes and examples. Create your own material requisition flow charts using the ConceptDraw DIAGRAM diagramming and vector drawing software extended with the Flowcharts solution from the Diagrams area of ConceptDraw Solution Park. A so-called “purchase order” (or PO) is a document used in commerce. It is the first official offer, which is issued and given from the buyer to his seller. In this document the buyer indicates the type, quantity and price for his product or service. This “purchase order” is used for controlling the purchasing of products as well as services from the external suppliers. Issuing the purchase order does not mean initiating a contract or agreement. If there is no contract, signed before the “purchase order” being issued, then it is the process of acceptance of some particular order by the seller. This acceptance forms a “contract” between the buyer of the product or service and the seller of the product or service. Within many of the companies the “purchase orders” can be used for many different reasons. These orders allow buyers to simply communicate with the sellers and to describe their intentions to sellers. These orders may also help a purchasing agent manage all of the incoming orders as well as so-called “pending” orders. Using “purchase orders” enables to streamline the process of purchasing to some particular standard procedure. Commercial lenders, as well as financial institutes, may provide the financial assistance, based on the purchase orders. There are many so-called “trade finance facilities”, which almost each of the financial institutions allows business people to use against purchase orders. It can be done before the shipment credit facility, after shipment credit one, during the trade finance facility, foreign bill purchase credit facility, bill retirement credit facility, “order confirmation” or so-called “Follow-up”. The purpose of using the “purchase orders” is to procure the materials for a stock, procure services, direct consumption or cover customer requirements. It can be done using all of the external resources, including procuring some definite material, which is needed to be in plants, taken from the internal sources. They may also be placed when the purchasing and procurement transactions take place by taking full advantage of the existing transport conditions. Creating a “purchase order” is usually the first step of the process of payment for the purchase. Some of the “purchase orders” may require a so-called “SKU code”. Within a so-called “ERP system”, any “purchase order” can be created manually. It also may require the confirmation or it can be changed any time in a way of its editing. Within an “ERP system”, creating a “purchase order” manually within the system may look as a step-by-step process from arranging logistics (product delivery, for example) to providing a so-called “Transaction Code”. This step-by-step process may also include involving the “materials management”, the process of “purchasing” itself and issuing the “purchasing order” itself. The type of the order always can be chosen from the screen in case the computer system is used. A so-called “vendor code lookup” may be needed to be selected for a reason of issuing the “purchase order”, as well as the information about the organization, the group and the company code. Usually “purchase order” does not contain any contract language and they are regarded instruments, regulated by the “Uniform Commercial Code”, which is one of the uniform acts numbers, being used in law for the purpose of harmonizing the law of sales as well as other commercial transactions within the US. Also, another similar law can be used for establishing any “purchase order” as a contract. Although “purchase order” is known as a kind of a contract, it is common to accompany the purchase order acceptance with some legal document. This document can be “The terms and conditions” of sale, establishing additional or some specific legal conditions of some contract. In the United States of America “Federal Acquisition Regulation” states all of the purchase orders as they all should be issued on a fixed-price basis. Although the provision can also be made for unpriced “purchase orders”. Such unpriced purchase orders can be issued where it is impractical to obtain any pricing in advance of the purchase order issuance. Many of the “purchase orders” are transmitted electronically with the use of Internet, so there is no need for using paper. Nowadays, the way of issuing the “electronic purchase orders” is the most popular during the process of buying goods or providing services online. “Electronic purchase orders” are also known as “E-Purchasing”, “E-Procurement” or “E-Purchase Requisition”. Although “electronic purchase orders” are the most common nowadays, there are also “non-electronic purchase orders” still used. The record of the “purchase order” in the most of the business firms is still with the use of paper, so they are still in need for a proper “purchase order format”. The term of “Purchase Requisition” can be described as a document, generated by some user’s department for notifying another department, which is a “purchasing” one about the product or service being ordered as well as about the quantity of products and services and the period of time they have to be delivered within. This “Purchase Requisition” may include the need for the authorization in order to proceed with this purchase. “Purchase Requisition” is also known as “Requisition” or “Purchase Request”. In order to describe this “Purchase Requisition” you can create a “material requisition flowchart”. This flowchart can be simply made in ConceptDraw DIAGRAM software using the “Flowcharts” solution, which can be found and downloaded from the “Diagrams” area of ConceptDraw Solution Park on this site, as well as from the ConceptDraw STORE, which is another unique product of CS Odessa and which allows to choose any of the existing solutions for many different purposes, including creating the “material requisition flowcharts”. The basic functions of an MRP system include: inventory control, bill of material processing, and elementary scheduling. MRP helps organizations to maintain low inventory levels. It is used to plan manufacturing, purchasing and delivering activities." This sample was created in ConceptDraw DIAGRAM v12 diagramming and vector drawing software using the Flowcharts solution from the What is a Diagram area of ConceptDraw Solution Park. This sample shows the Flowchart that displays the solid-state welding processes, the types of welding. 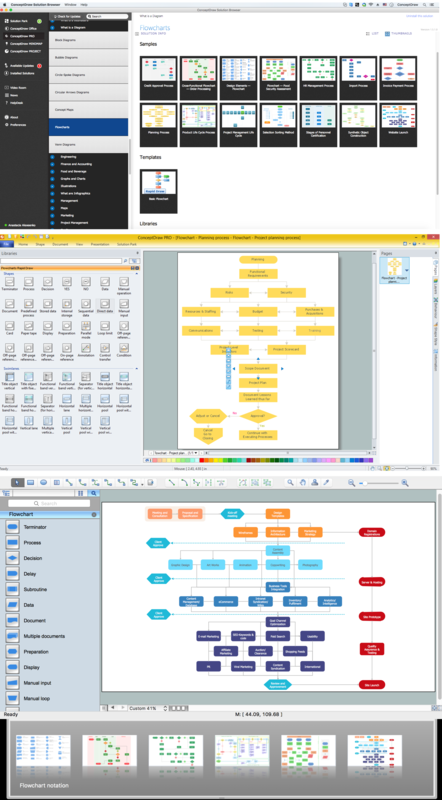 Create you own flow charts of process-driven software applications using the ConceptDraw DIAGRAM v12 diagramming and vector drawing software extended with the Cross-Functional Flowcharts solution from the Business Processes area of ConceptDraw Solution Park. 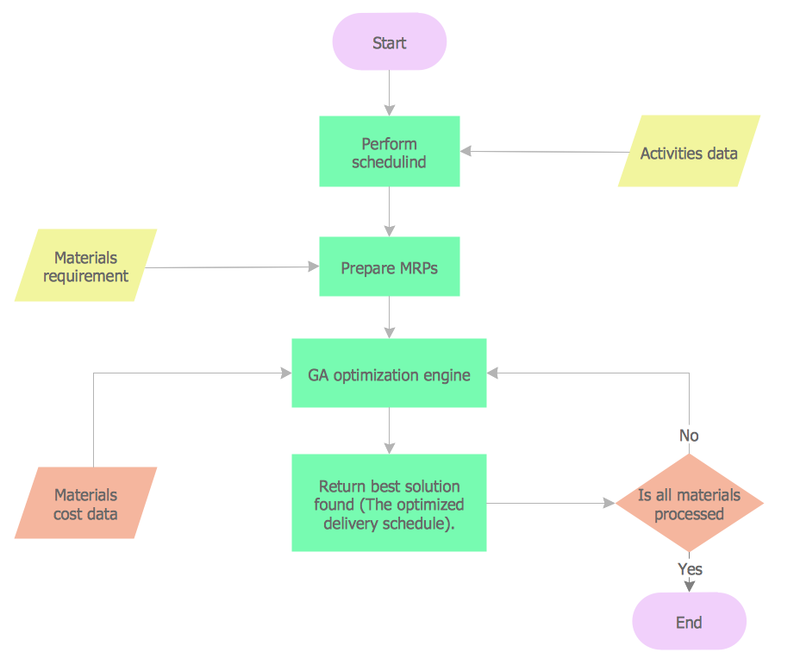 The programming project flow chart example shows the logical process of execution. Create bar charts for visualizing problem solving in manufacturing and economics using the ConceptDraw DIAGRAM v12 diagramming and vector drawing software extended with the Bar Graphs Solution from the Graphs and Charts area of ConceptDraw Solition Park.